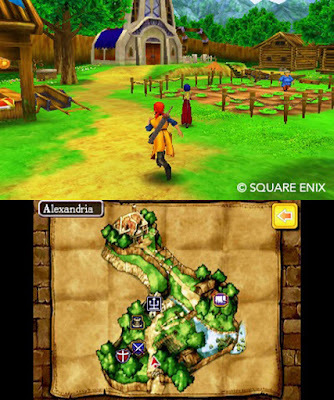 Dragon Quest VIII is one of the best JRPGs ever crafted, and the 3DS is a great platform for it. I could leave the review at that and slap a score on it, but that would be rather lazy, so here’s a bunch more words about how good this game really is. Related reading: Matt's review of the iPad version of Dragon Quest VIII can be read here. The Dragon Quest series has always focused on a remarkably simple narrative loop, one that is simple yet addictive. Where Final Fantasy and other long-running JRPG franchises have become almost too complex in what they’re trying to achieve, Dragon Quest has been able to putter along, winning over one generation of fans after another. In Dragon Quest games, players take control of a small party of heroes and move from town to town, in pursuit of an eventual battle with the game’s Big Evil. So far, so much like your standard JRPG. What distinguishes the Dragon Quest games is that each town also has a narrative arc of its own. Upon entering the town, the heroes learn of some threat or challenge facing it, and that will generally lead them to take on a dungeon, tower, or other such apparatus filled with monsters and the eventual boss. Upon defeating that boss, the local threat is removed and the heroes are given directions to the next town, as well as a further revelation to the main quest. And so they’ll move from little town to little town, working through the vignettes, all the while slowly marching towards the final, fated encounter. Many other JRPGs follow a similar formula, but few compartmentalise the experience quite as cleanly as Dragon Quest does; and while you could argue that reducing a game to a formula as this franchise does would result in something dry, in actual fact the exact opposite is true. Because every area has its own story to tell, the Dragon Quest developers have, over the years, found remarkable ways to ensure that each vignette is memorable, whether that’s because of the vibrant NPC characters, the game’s sense of humour, or the story writer's spot-on ability to use regional accents and mannerisms in such a way that each successive environment feels genuinely new. While Dragon Quest VIII does have a wicked sense of humour, it’s also not without intelligence. 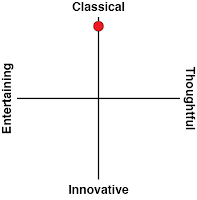 A strong theme of determinism runs through the narrative. Without giving away too much, for people who haven’t played the game before: the party of heroes in this instance are chasing down a villain who has done some pretty horrible things. These horrible things are magical in nature, and the team naturally assumes this means that by defeating the sorcerer everything will be set right. Except that doesn’t happen, and we learn that there’s something far worse that’s able to take control of people and compel them to commit evil. When this happens to one of your own teammates, the typical deterministic questions about the extent to which people can be held accountable for what they do, and the moral questions that arise as a result, are all brought into sharp focus. Unlike, say, Final Fantasy, these themes aren’t dealt with on a particularly deep level - instead the game prefers to remain light-hearted and often funny throughout - but enough wit and intelligence went into the writing of Dragon Quest VIII that it elevates the game far beyond what most of its peers aspire to. Dragon Quest VIII isn’t quite as long as its immediate predecessor, Dragon Quest VII, but it is nonetheless a lengthy game, so it’s just as well that the gameplay mechanics are so refined. Combat is the classical turn-based action that we’re so used to with the series, but remains fun throughout thanks to the wonderful balance and even difficulty scaling, to keep you on your toes even as you make steady progress. The enemy designs help a great deal, too. They’re cute, and the enemies generally have ridiculous, pun-like names that you’ll chuckle over, even if you’ve played a dozen Dragon Quest games in the past. What lets the 3DS version down a little is the fidelity of the graphics. Dragon Quest VIII is such a vibrant, colourful game, and the 3DS hardware struggles to replicate effectively how beautiful it all is, with scenery “pop-in” meaning trees appear just a short walk away from your characters. I can’t remember exactly how significant the pop-in is with other versions of the game (such as the Apple iPad release), but I don’t remember it being quite this bad. Character models suffer from a greater fuzziness than their original designs deserve, too, and the occasional frame-rate drop when there was too much happening simultaneously on the screen really ground the action down to a halt. This explains why the game doesn’t support the 3DS’s 3D at all; the 3DS - even the New 3DS - simply wouldn’t be able to handle it. But that’s a minor complaint. People play Dragon Quest for its light sense of adventure, memorable characters, and lovely art direction, and this port reminds players of why VIII was so good in every way. Yangus and Jessica are two of the best Dragon Quest Heroes ever, and they alone are worth playing the game for; there are even a couple of little bonuses - including a remixed ending - for people who want to give the 3DS version a spin. Related reading: Dragon Quest VII is also on Nintendo 3DS. Matt's review here. You don’t come to the Dragon Quest series because you want weighty, intelligent plots. You’ve got Persona for that. You don’t come to Dragon Quest because you want in-depth and rewarding combat mechanics; that’s a space where Final Fantasy plays. What makes Dragon Quest so special is that each game manages to straddle a line between nostalgia for simple, elegant combat mechanics, and the modern game design world, where it can poke fun at itself and laugh along with players. 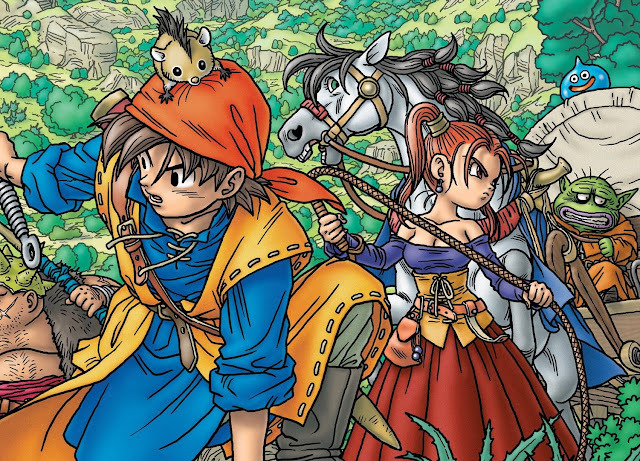 Dragon Quest VIII isn’t the perfect port in coming to the 3DS. 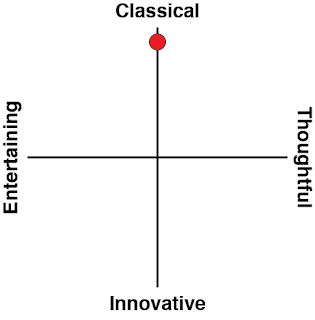 It is, however, very close to the perfect classical JRPG.